He was a renowned calligrapher and Confucian scholar, who was also involved in politics in imperial China. More than a century after Weng Tonghe (1830-1904) is said to have been sacked from office as a minister by Empress Dowager Cixi after they fell out over a campaign, his personal belongings return to Beijing in the form of an exhibition tour of the city. Titled Specific Artifact Exhibition of Two Emperors' Tutors, Weng Tonghe, and the Weng Family, the show opened in the Beijing Stone Carving Art Museum last week as part of a four-stop tour. 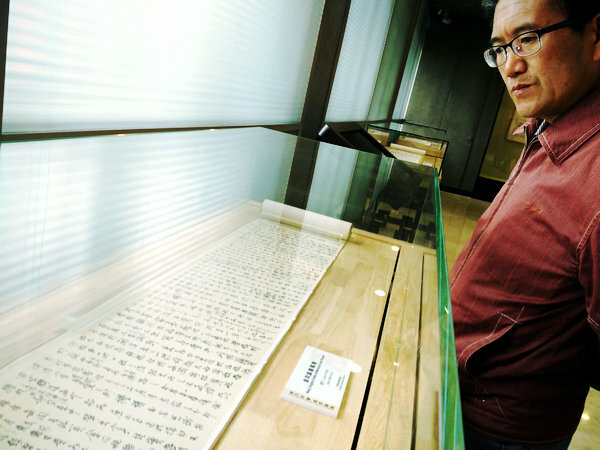 More than 70 sets of exhibits, including calligraphy works, porcelain collections and a memorial to the throne, borrowed from Changshu Museum in Jiangsu province, reflect his life. Born in East China's Changshu city, Weng, an influential figure in Chinese history, was the teacher of Qing Dynasty (1644-1911) emperors Tongzhi and Guangxu, and became a politician. He was in charge of several ministries in the Qing Dynasty, including as head of a diplomatic agency and revenues. "He was a microcosm of figures in Chinese history who worked for the country's revival," says Wang Dan, director of Beijing Stone Carving Museum. "The exhibition is also a look at the Qing Dynasty history through Weng's eyes." After Weng left his office in Beijing, he returned to his hometown and focused on studying ancient Chinese calligraphy. He lived there until his death. "That is why a complete set of his personal belongings was left in Changshu," says Qian Ke, deputy head of the cultural relics department at Changshu Museum. All the exhibits on display in Beijing are original pieces rather than replicas, and some have never been seen in public before, says Qian.